Let me start by saying this, I am not anti union. If you look at my record I have supported Union’s causes more times than I have criticized them as can be seen in a post I wrote about the NZEI and National Standards 18 months ago. The interactions and opinions I share now about the Unions and the Ports are solely based on this issue and not a a past of blindly supporting either the Left or Right of this, or any other conversations, about Unions past, present or future. I wrote a post last week about an interview I did with Garry Parsloe from the Maritime Union but as most talkbacks listeners will be aware this conversation has continued on. Prior to this conversation I had no position on who I believed was right in the debate, and to be honest to this date I would still say that I don’t believe there are any innocent parties here, I don’t believe either side truly bargained in good faith and through obstinate belligerence from both sides we are now at an impasse. For me though the case set before the public now has demonstrated that the Ports in this case are ‘closer’ to being correct that the Unions without the ‘rose tinted glasses’ idea that they have done no wrong. Yesterday we had Cameron ‘WhaleOil’ Slater on the show yesterday talking about the headlines he had made releasing information of a Port’s of Auckland worker, Cecil Walker, and how he received 21 weeks paid leave in a year where sadly he lost his wife. 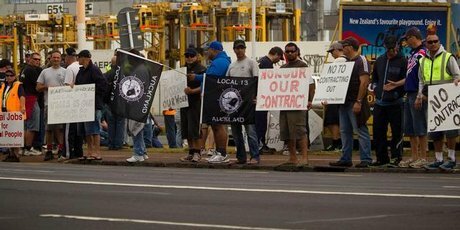 It would appear that Whale’s point was after Mr. Walker came out and critisized the Ports, he wanted NZ to get a fuller understanding of how this one worker had been treated by his employers. We had earlier in the week also offered Garry Parsloe to come on the show again, live in studio for a whole hour. We wanted our listeners to be able to interact with him and allow them to make up their own mind. We also offered Richard Pearson the same opportunity so we’d have them both on at the same time but he flatly refused to be in the same room as Mr. Parsloe in a media setting. A testament to perhaps that impasse I spoke of earlier. In my interview yesterday, Cameron Slater brought up some other information about another case at the Ports where a worker had been dismissed for bullying tactics, a section of the audio is below. The Port worker was never named, and I don’t believe identified in any way, however for his privacy I have left off the first part of the comment in case anyone knows him personally and can identify him because of that, but certainly to us, the great unwashed, we would never know who this man is by Whale’s comments. Subsequent to yesterdays show we received a call to my producers cell phone from Helen Kelly from the CTU. Again I have edited this slightly to protect some personal details that were given out in the message. Couple of things about the answer phone message. If there has been a slandering of a Port worker I would of course retract and apologise, but from listening to the audio I don’t believe there has been. For me to ‘give [Cameron Slater] space’ on the station being a concern for Helen Kelly is ironic as we have had on Garry Parsloe so many times the news room jokes about giving him his own slot. The opinions and spokespeople for the union position have had far more airtime on my network than the counter view which you heard via Cameron Slater and for Ms. Kelly to say we needed to ‘rectify’ the situation implies that we have done something wrong, which I don’t believe we have. I also got the feeling that there were threatening undertones when Ms. Kelly informed us that ‘[we] were liable for that as well’. As I advised you today this time is unsuitable and was not confirmed nor was it scheduled as a right of reply. Yesterday your show enabled statements to be made about a Port worker that were wrong and extremely damaging to him. We have requested that you apologize for this and have offered you the facts. We would also like the chance to be on the show to talk about the dispute separately from this. I am available at 11 tomorrow and new stories will be available by then of interest to your listeners. Your station operates on a set of principles. When it makes a mistake it should fix it. We are giving you the chance to do this as a settlement of this issue. Also in a phone call to my producer Helen Kelly said speaking of me, ‘I wouldn’t talk to that idiot on air’ and let us know that ‘the paperwork was in the mail’ which I can only take as a threat of legal action. Purely by chance we have Cameron Slater on again today as a part of a daily news headlines conversation called The Panel, and whilst talking on air about this issue and the fall out with Helen Kelly Mr. Slater offered to speak directly with Ms. Kelly in studio. I thought this was a great idea so the offer was made to her to come into studio tomorrow at 11am (which if you read her earlier email she was keen to do) and put her concerns directly to WhaleOil. We go a three word email back from that offer. Subsequent to the now refusal to come on air I have received this message via my facebook page from Ms. Kelly. I don’t expect to be used by your station in the way you seem intent on doing. I have had a respectful relationship with Rhema and have done many interviews etc. I have asked you to correct a very serious statement made on your Programme about a person who is involved in the Port dispute and to date this has not been done. I would expect you would want to do this if my concern is valid. I have also asked to talk to you about the dispute. I note Mr Slater is saying I have threatened you with suing if you keep using him. You know this is not true. Any liable action will be regarding an uncorrected statement. My offer is still open and I am happy to talk about it with you. I am on 021XXXXXX. One point, Helen Kelly is correct she never threatened to sue us for using Cameron Slater, I’ve never said that and don’t know where it has come from. However, as you heard in the answer phone message, she doesn’t think we should be using him, and one can assume that Helen Kelly would be happier if we didn’t use Cameron Slater again. I believe in open and honest conversation, what Helen Kelly wants is communication on her terms. I think it’d be great to have both parties in the studio to discuss this situation. As the public we are still in a position of ‘he said/she said’ and both sides are calling each other liars. That doesn’t help the public perception or knowledge of this situation. The invitation is still open…and there is no issue with my show and Helen Kelly. If there is another conversation worthy item in the future you can bet we will still be contacting her for comment. I also have a challenge to both sides. If indeed there was slander yesterday of a Port worker in my show then have the Port worker contact me. I wouldn’t think it possible that a Union President can bring any kind of legal action against a media outlet if one of there members was slandered, surely it would need to be taken by the person who has been slandered. But equally Cameron Slater says he has the evidence that his claims are accurate and correct, I’d be happy to see that as well Mr. Slater.